Link Microtek, a manufacturer of microwave and RF subsystems and components, has designed and produced a spaceflight-qualified microwave rotary joint and associated waveguide components as part of a Ka-band antenna pointing mechanism (APM) being developed by Surrey Satellite Technology Ltd., which is an independent company within Airbus. Destined for use on LEO satellites, the Ka-band APM will enable the maximum amount of high-data-rate information, such as high-resolution images or video, to be transmitted to a ground station as the satellite completes its rapid traverse of the sky. Within the APM, the rotary joint performs the critical function of feeding the RF carrier signal from the static side of the antenna to the rotating side. 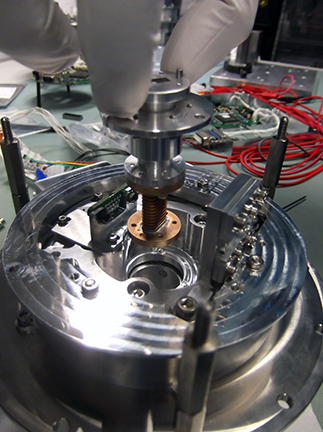 This photo shows one of the Link Microtek rotary joints being inserted into SSTL’s Ka-band antenna pointing mechanism. SSTL’s APM design includes two Link Microtek rotary joints z— one for azimuth and one for elevation — as well as interconnecting waveguides, which are made from aluminum to minimize weight and are crucial to the overall RF performance of the system. Each rotary joint is of single-channel, non-contacting design covering the frequency band 25.5 to 27.0 GHz. Also made from aluminum, the rotary joints feature a WR34 waveguide interface on both ends and a bespoke flange design. The measured RF performance has a low maximum insertion loss of 0.29dB, a maximum insertion loss WOW of 0.12, maximum VSWR of 1.28:1 and maximum VSWR WOW of 0.13. Link Microtek’s Managing Director, Steve Cranstone, said that as the rotary joint and waveguide components are for use in spaceflight, they had to combine very low loss performance, low weight and long life, while at the same time being able to withstand the extreme physical demands of vacuum, vibration and temperature variation. This made the design and manufacture of these parts quite challenging. Although ensuring that these intricate parts could cope with the hostile conditions of spaceflight was an enormous challenge, this was one that the company's in-house team of engineers completed successfully, drawing on their decades of experience in this field to produce components of extraordinary robustness and stability. The rotary joint, for example, showed no significant degradation of performance even after an accelerated life test of nearly 700,000 revolutions. Simon McLaren, Mechanisms Team Leader at SSTL, added the company is pleased with the performance of the non-contacting Ka-band rotary joint and waveguide RF feed network developed by Link Microtek for use in Surrey Satellite Technology Ltd.’s evolving antenna pointing mechanisms product range, to increase downlink capacity over existing technologies.